Travis Unified School District Vacaville and Fairfield, Calif.
Tyco Security Products’ hybrid PowerSeries Neo intrusion system paired with Alarm.com’s interactive services delivers an easy to use security solution for Travis Unified School District, handling a complex employment roster and associated security for a number of school buildings. The Travis Unified School District in California, which serves about 5,500 students, includes Travis Air Force Base, portions of the cities of Vacaville and Fairfield, and portions of unincorporated Solano County. The district includes five elementary schools, two of which are within the perimeter of Travis Air Force Base, a middle school, comprehensive high school, alternative high school and a community day school. In an active school district such as Travis Unified School District, changes occur everyday. People are added to or deleted from the employment roster, while others move among the various schools and need to access one or more alarmed doors. 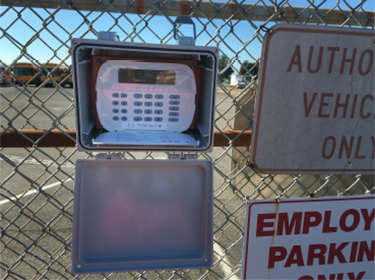 Each time there was a personnelrelated change, the individuals responsible for monitoring and maintaining the alarm system had to modify each school’s alarm system, a time consuming project. Being able to make updates, identify usage errors and review the system for maintenance-related issues were some of the immediate benefits of PowerSeries Neo. The process involved generating a list of accounts and names and the related alarm codes and then sending that information to the security systems integrator to update the system. Just adding a single person, such as a newly hired custodian, could take up to an hour, while a long list of changes could be a one- to two week process from submission through verification. With time-management and streamlining systems in mind, the district also desired to be able to make changes—such as arming and disarming doors—from a single location and to also monitor alarm activity as it happens. Under its existing system, a school official was required to physically go to the site when an alarm sounded to determine if it was an actual event or more likely a false alarm, such as a student trying to gain access through a locked door. Another challenge to both personnel time and the school’s budget was the maintenance required on the individual door sensors. Insufficient battery life required batteries to be changed out every two or three years on the alarmed doors. Additionally, the school district was under a mandate to eliminate phone landlines as its alarm system backbone. 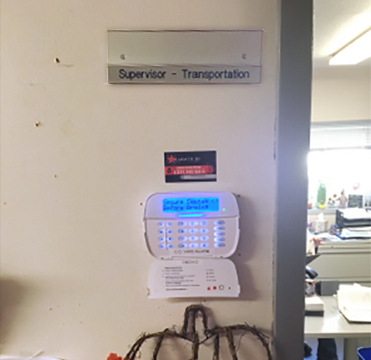 Working in concert with its integrator, Alarmtech in Vacaville, California, the Travis Unified School District installed Tyco Security Products’ DSC PowerSeries Neo as its customizable intrusion system. The goal was to simplify the management of its intrusion system by giving district employees the opportunity to add new employees into the system and to remotely monitor activities and incidents. The installation took about two to three months to complete and involved the installation of 50 control panels and the upgrade of 200 door sensors. Being able to make updates, identify usage errors and review the system for maintenance-related issues were some of the immediate benefits of PowerSeries Neo identified by David L. Florez, director of foodservice, transportation, maintenance and operations for the district, who also serves as risk manager, IPM coordinator and energy manager. The PowerSeries Neo project within the Travis Unified School District involved the installation of 50 control panels and the upgrade of 200 door sensors. The issue of waiting weeks for updates has been alleviated. Through an enterprise security console exclusive to PowerSeries Neo, Florez can leverage the features of the Alarm.com connected technology to modify codes within the system with a single click. Alarm.com provides a user interface through an online app and management system. Unlike the old process of inputting data for each door, now adding someone requires only typing in a name and code and then selecting the appropriate doors from a list. According to Phil Speck, Operations Manager for Alarmtech. “The new PowerSeries Neo system reduces the time involved from just a couple of minutes, compared with an hour or more previously,” he said. The customization of PowerSeries Neo also allows Florez to share responsibilities with others in the district so it isn’t a one-person-only job. The system enables him to set his own parameters for actions such as auto arm or setting specific time frames based on scheduling needs. During the school year, the building is typically accessible and used for a longer period during the day, whereas in the summertime the alarm systems needs to be turned on earlier as use of the school buildings is limited. The intuitive nature of PowerSeries Neo also helps with the maintenance. As Florez pointed out: “When I pull up the system to review, I get a notification if there is a problem with a specific device. The wrench icon says there is a problem and when you pull it up it will tell you the problem” such as no connection, a malfunction with a door or a battery issue. That information then can be passed along to Alarmtech for maintenance. Another opportunity presented by the upgrade to PowerSeries Neo was the ability to use outdoor wireless beam detectors without having to trench and run wires. There is an area near the transportation building and maintenance yard that was the target of vandalism—broken fences and locks and stolen equipment—that the district now protects with motion sensors. Thanks to PowerG technology, the range of PowerSeries Neo allows them to cover the maintenance yard, which measures 300 feet long by 350 wide, without using repeaters, said Speck. The school district also leveraged the range of the PowerSeries Neo with PowerG technology to help monitor its transportation building and maintenance yard. PowerSeries Neo’s ability to easily integrate with other systems will be explored in the future to enable the Travis Unified School District to tie in its existing exacqVision video and Kantech access control systems from Tyco Security Products to allow visual monitoring of alarm events. The district has about 150 cameras covering the various schools. The reliability of visual verification of alarms will bring a new dimension to the plan, according to Florez. “We won’t have to wait for Alarmtech to look at it. I can see it whether it’s at my desk or at home,” he said. It will also save time that might have been spent traveling to the command station or waiting for reports to come in. Like the monitoring of the transportation area, the district is also looking into adding remote alarm capabilities to a concession stand near the high school athletic fields, an area where it will be difficult to install a wired intrusion system. Travis Unified School District in Fairfield, Calif., was formed in 1962 to provide education for the children of local farmers and Travis Air Force Base personnel. Located between Sacramento and San Francisco and just west of the Napa and Sonoma wine country, the district has built a high-performing K-12 system that includes Cambridge, Center, Foxboro, Scandia and Travis elementary schools; Golden West Middle School; Travis Community Day; Travis Education Center; and Vanden High School. Alarmtech has been locally owned and operated in Vacaville, Calif. since 1994. The company specializes in fire alarm systems, residential and commercial alarm systems, wireless alarms, security cameras, CAT-5 computer cabling, home theater systems and intercom systems, all of which it services and installs. Security and fire systems are monitored through a 24-hour UL-listed monitoring agency.